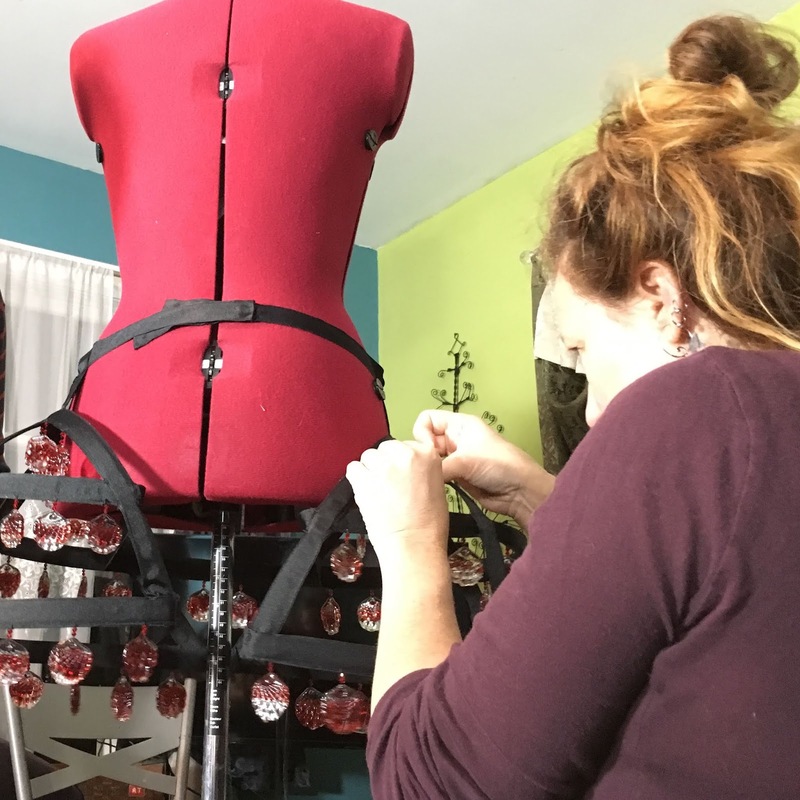 Period Corsets had the amazing opportunity to collaborate with gifted glass artist Sabina Boehm for an on-going series of wearable art pieces. The most recent installment was a two-part piece of two ensembles. Themed "Fire and Ice", Sabina used her handmade glass medallions and swirls to adorn bespoke corsets and our full panniers. The first look, "Fire", included a hand stitched corset, designed and made entirely by Sabina, featuring dangling red medallions and "fire" bust cups. To match this look, Period Corsets created an all black full pannier cage and assisted in stitching on the many medallions which embellished the "bars" of the cage. The look of this finished piece is stunning indeed. And the sound created by the glass pieces tinkling added to the theme. As the wearer moves about, the glass florets clink against each other creating a crackling noise reminiscent to fire. For the look of "Ice" Sabina went with cooler tones of ivory, white and light blue. Using a similar method to her "Fire" piece, Sabina used the lampwork technique to create hundreds of glass swirls. For her base corset, Sabina chose our c. 1660 Kristina stays, flatlined to an ivory silk. Period Corsets started her with a fitting corset to test the shaping and sizing before constructing her final one out of the silk material. Her handmade swirls took hours to hand sew to the corset surface, a group effort among the artist, ourselves and willing friends. Due to the slippery surface and shaping, the swirls required just the right placement and stitch to keep them from shifting around or falling off. Detail of the glass "lace edging"
Our next task was the matching open cage pannier. Period Corsets constructed it in all-white material and again spent much time helping to apply the glass ornaments to the outer surface. One swirl at a time! 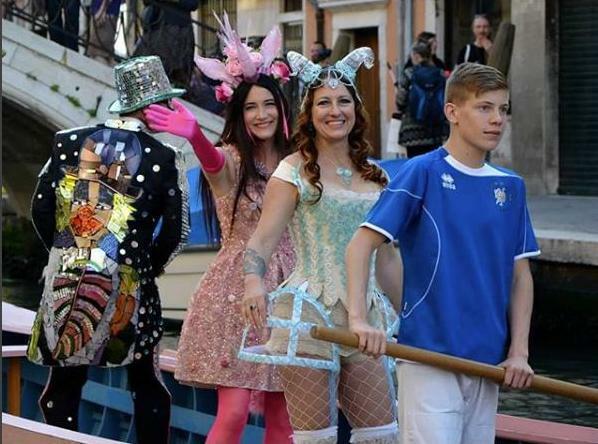 This second look had its grand début in Murano, Italy, a major glass center of the world. For centuries, Murano glass artists have kept their techniques a secret, protecting their unique ways of creating the intricate glass pieces for which they are so famous. Just recently the Murano glass artists finally opened their doors to established and budding glass artists alike to share in their knowledge. As part of its yearly, traveling conference, the Glass Art Society went to this famed city to share, learn and celebrate. 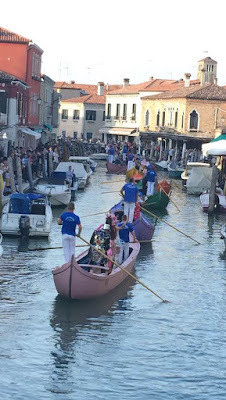 Complete with a ride down the Veneta Laguna, the conference included a wearable art fashion show displayed entirely on gondola boats. A truly unique display for this truly unique art form. Welcome! Period Corsets® is your complete source for historic undergarments and custom costumes. Opera and theatre companies, universities and colleges, movies and TV productions, and lovers of beautiful historic silhouettes buy our corsets, petticoats, skirt supports, and underwear for their productions and private use. Our products are available through our website in a range of sizes, fabrics, and colors; we also custom-design items to meet your specific needs. We design, develop and make all our garments in our Seattle, Washington studio. On this blog we look forward to sharing with you our passion for fine quality sewing, historic silhouettes, meticulous draping and pattern-making, as well as news about new products we are developing. Stay tuned!